One thing I love about the changing of the seasons is the way the color palettes shift. After the pastels of spring and the sunny brights of summer, we are moving into earth tones, and yes, even a lifelong pink fan can be drawn to fall. 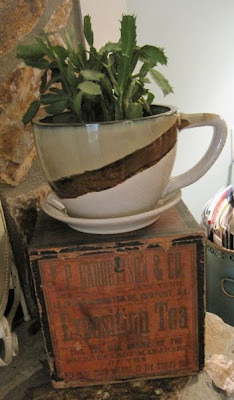 And so it was that a very earth-toned teacup at Homegoods in Marietta caught my eye over the weekend. I love the crackling you can so clearly see in the handle. 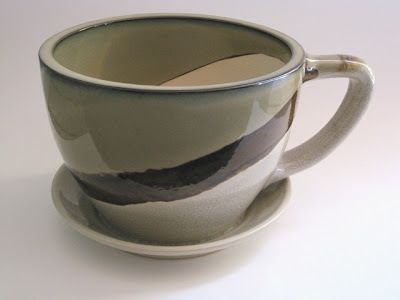 I also like the color gradations in the entire teacup, a color scheme which seems very fallish to me. Have you noticed that the teacup seems a bit large for the saucer? Then you're a smart cookie and have no doubt guessed this is actually a planter! I've seen lots of pretty floral planters shaped like teacups, but never one that is so absolutely perfect to sit atop this old Exposition Tea box on my living room hearth. And maybe it'll bring luck to the Christmas cactus I've had on life support! Even though fall is here, I decided over the weekend that since it was still pretty warm here in Georgia it would be OK to try one more iced tea. Besides, it's October before it really starts to *feel* like fall anyway. Have any of you tried this tea from Mary-Lake Thompson Ltd.? For some reason I was expecting this to be iced tea mix, but inside the package were four giant teabags for brewing four cups of tea each. 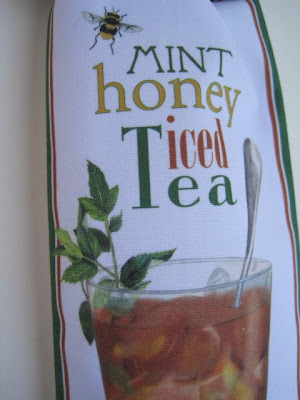 The ingredients include organic spearmint, organic dried honey and organic lemon myrtle. I really enjoyed the cool, minty flavor of the iced tea I made, although I did decide to add sweetener to my glass of tea. 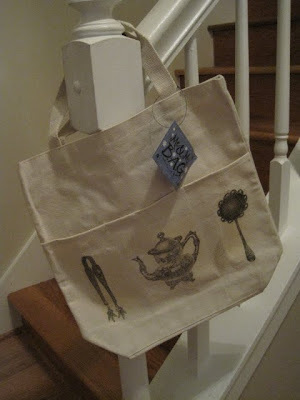 This is not the sort of thing I would normally buy for myself, but if I come across it again I just may have to get some as gifts for tea-loving friends. 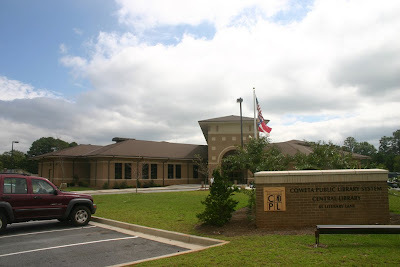 There is much to praise about the community in which I live, and one of the qualities I most admire about Coweta County is its commitment to public libraries. In 2008, we celebrated the opening of the brand new Central Library, above. And just last week, a former Carnegie Library downtown (circa 1904) wrapped up months of renovations with a grand re-opening and is now serving as a reading room/library once more thanks to local preservationists. 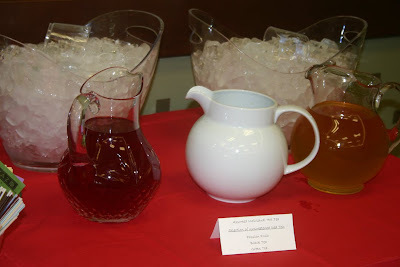 On Wednesday, I had the pleasure of visiting the Central Library for a Literary Tea with Georgia author Haywood Smith, whose books include "Queen Bee of Mimosa Branch," "The Red Hat Club," "The Red Hat Club Rides Again" and "Wedding Belles." 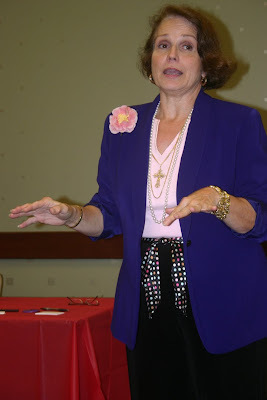 One of Haywood's books was reviewed (favorably) by one of our writers in a recent issue of Newnan-Coweta Magazine, and I purchased her newest book, "Ladies of the Lake," and look forward to reading it. 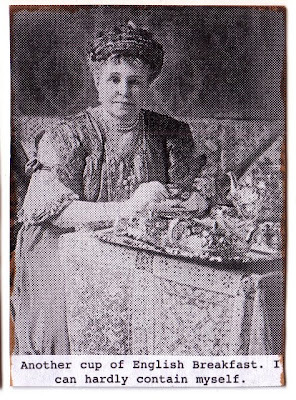 Haywood, shown here, told tales related to her husband of 30 years leaving her for a stripper, as well as the unexpected blessing of getting bitten by a rabid raccoon last year. (The resulting treatment cured her arthritis, and she is pain-free for the first time in years. Imagine!) Since I haven't yet read her books I don't know yet if I'm a fan of her work (although I fully expect to be), but I can definitely say I'm a fan of her! 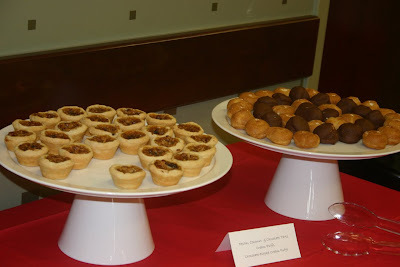 ... and cream puffs and pecan tassies, all while a most delightful author entertained the audience (and perhaps unknowingly encouraged this aspiring novelist!). 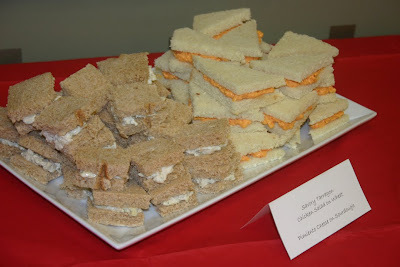 Getting to spend the afternoon at a new library, enjoying some new tea foods, meeting a few new tea friends ... I ask you, does it get any better than that? 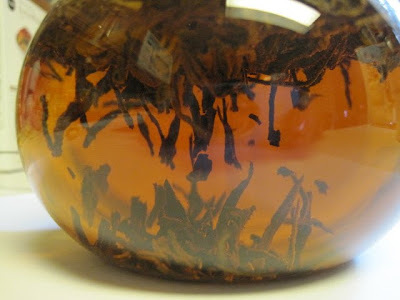 Yunnan is a tea I've tried before, but it seemed different this time. And quite enjoyable! 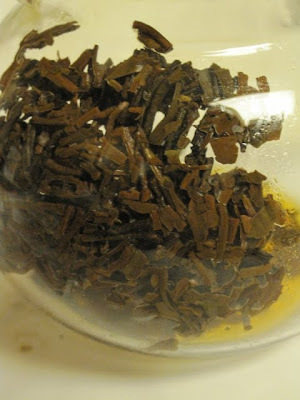 Dry leaf appearance: Shavings of pine bark with a few lighter colored bits throughout. Wet leaf appearance: Chippy, wet-bark-looking bits of tea leaf. Steeping temperature and time: 1 teaspoon of tea, 205 degrees, 4-1/2 minutes. Color: A deep, rich brown. 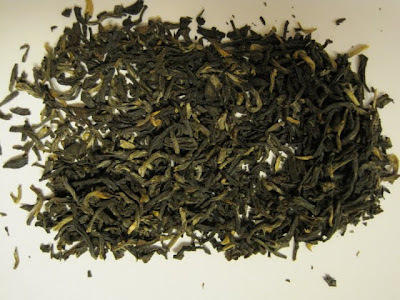 Flavor: Although this Yunnan is quite a bit stronger than the one I've tried before (I don't remember the vendor), I enjoyed it very much, and the taste was nothing like L.S., I am pleased to say! I drank the first cup completely black, but since it was getting a bit astringent there at the end, I decided to have the next cup with a bit of milk. Delicious! I could drink this tea all morning long just fine, I think, with a little milk on hand. 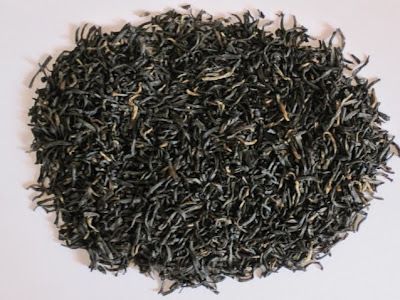 Additional notes: Michael Harney says that Yunnan "offers a delicious combination of full body and sweetish flavors, with a certain earthiness and even a mild pepperiness, balanced by the sugars from lots of tip." Guess that explains those tips in this tea, and I do believe the earlier one I tried was called Tippy Yunnan. 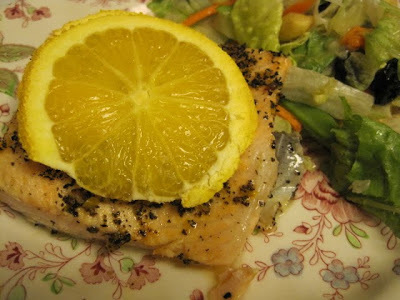 My husband and I have eaten a lot of sandwiches the past few months, so it was pure luck when a friend asked what I was cooking for supper the other night and I was able to reply, "Earl Grey-Crusted Salmon with Juniper Berries." "Really?" She just looked at me. "Yes! But it's so easy!" I said, and it is. 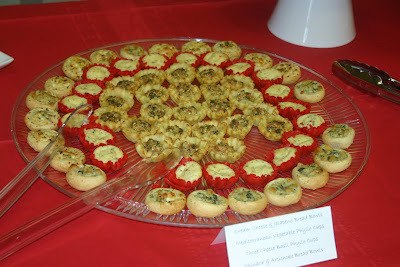 About two years ago, I wrote a blog post about a delicious new dish I'd been making. The basic recipe came from the book "Eat Tea" by Joanna Pruess with John Harney, but I had been unable to find the called-for juniper berries, although I must say the recipe is just fine without them. I made the recipe so often in 2007, however, that I think I tired of it. Then, when I was at the beach last month I came across a jar of juniper berries at the market, and it triggered memories of that easy and delicious salmon recipe! 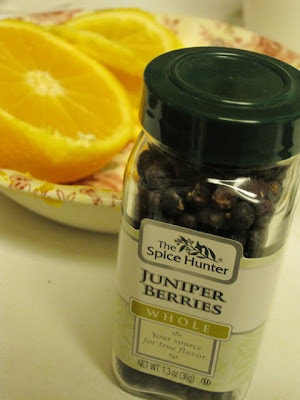 It was fun to discover the juniper berries, which smell sweet, like a fruit, and have the taste and texture of an orange- and pine-flavored miniature raisin. Serve the cooked salmon with salad and voila, supper! Preheat oven to 350 degrees. Grate the orange and save the zest. Then, cut fruit into 1/4-inch slices. In food processor, combine about two tablespoons orange zest, the tea leaves, juniper berries, salt and pepper. Process for about a minute. Heat olive oil in iron skillet over medium to high heat. Season salmon with salt and pepper and saute, flesh side down, for about 5 minutes. 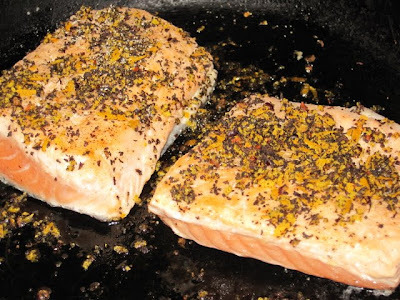 Turn salmon over in pan and sprinkle the tea/orange zest mixture equally over fillets. Top each fillet with two orange slices and bake in oven for about 8-10 minutes. Delicious, and it's cooked and on the table in just 20 minutes! Several of you were very close, but no one guessed the correct number of freebie magazines (22! ), so to the Random Number Generator we go. And the winner is ... Lisa Leggett! If you'll e-mail your snail mail address to angela@newnan.com, I'll send you a list of magazines so you can choose your prize. Congrats! 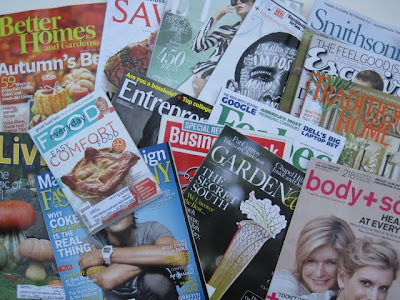 Today, I want to share with you how I get so many magazines for free. Now I am both a) a magazine junkie and b) a magazine editor, so I probably have an unusually high level of interest in reading magazines. They are a source of news and entertainment, but they also give me ideas I can use in my day job. So, there's that. But it occurred to me that some of you might be interested in this: Of the 24 subscriptions I receive at home, I get 22 of them for free. Which ones? In no particular order: Saveur, Better Homes and Gardens, Woman's Day, Marie Claire, Elle, Old House Journal, Martha Stewart Living, Garden & Gun, Country Living, Gourmet, Fast Company, Entrepreneur, Everyday Food, New York, Traditional Home, Esquire, Business Week, Smithsonian, Body and Soul, Forbes, Living the Country Life and the Wall Street Journal. The two I pay for? More (which was some great deal like $6 for a year) and Victoria (for which I actually pay full price). I currently buy my tea magazines on the newsstand, and that's about all I buy for myself. How do I get so many magazines for free? Three ways. Freebizmag.com, e-rewards.com and mycokerewards.com. Sign up with freebizmag.com and they occasionally send you offers from magazines (and not just business magazines) trying to increase their circulation. At e-rewards.com, answer surveys and earn dollar credits which can then be used to purchase free, no-credit-card-on-file subscriptions, so you don't have to worry they'll automatically renew you. Finally, once every few months I enter the boxtop and bottlecap codes from Coke products at mycokerewards.com. The points add up and can be used to "purchase" magazines. So while you may not want as many magazines coming to your home as I do, you just may find that some of the ones you already read and pay for can be obtained for free! -- In Body and Soul, I read that Martha Stewart likes a small cup of cappuccino ("good cappuccino") each morning, while daughter Alexis likes to drink Earl Grey "boiling hot with nothing added." -- In Better Homes and Gardens, the "Fresh Finds" include the new Double Dark Chocolate Maté from Republic of Tea. Yum! -- Gourmet's "Obsessions" include an unusual teacup and saucer set I am happy to see is sold out, removing all temptation. Let's swap A Tea C's! 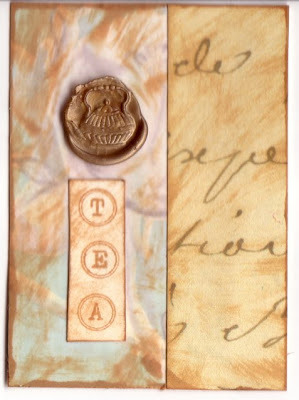 Last week, I wrote about the tea-themed ATC's, or artist trading cards, I had created from various stamps, wax seals and paper. An ATC is simply a 2-1/2 x 3-1/2-inch card you've decorated in any way you desire. 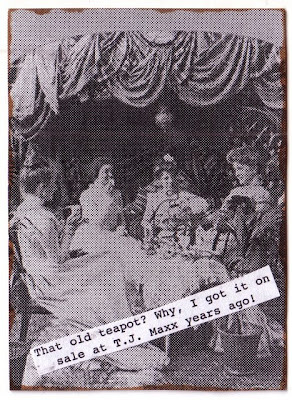 (An Artist Tea Card or "A Tea C" is the same thing, it's just got a tea theme!) Cards can be simple or plain. I've seen some that are very artistic, some that are stitched, some that are very scrapbooky. Mine will probably all be on the simple side, but I am enjoying making them. And, inspired by blog friends here and here, I am now going to host a card swap! If you'd like to swap two cards (just two) with another tea-loving friend, just e-mail your name and address to angela@newnan.com by Oct. 11. Then, when I have the list of all interested parties, I'll randomly pair up the cardmakers and e-mail each person the name of her (or his!) card swap partner. The first two images are from the Library of Congress. You can read more about them here. 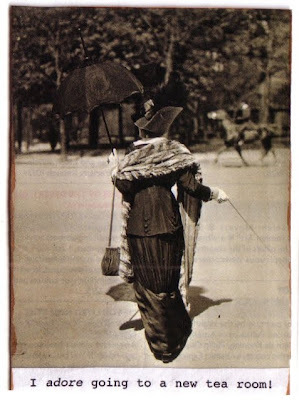 And the fancy lady going to tea image is simply one I saved out of a magazine. Speaking of magazines, whether or not you're interested in the card swap, let's have a giveaway! At home, not the office, I subscribe to 24 periodicals (23 magazines and the Wall Street Journal). How many of the subscriptions do you think I get for free? Those who guess correctly will be entered in a drawing to win a free magazine subscription, and I will give you a choice of several magazines from which to choose! If no one guesses the correct answer, well, I'll just have to throw everyone's name in the pot and choose a winner! Just be sure to enter before 7 a.m. EST tomorrow. Good luck! I've had this particular brand of tea only once before, a pear blend I believe came from Williams-Sonoma. The tube canister tells you to measure half a lid of loose tea. 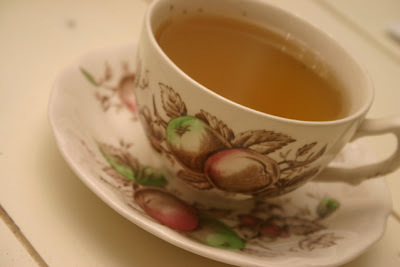 Once steeped, this lovely caffeine-free tea was simply divine! I could taste the orange AND the mint AND the beloved ginger, making this the perfect tea to welcome fall. 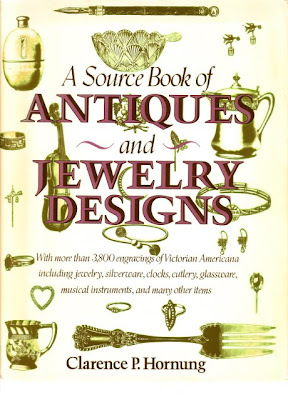 This idea came to me after a recent antiquing excursion with my mom where I came across "A Source Book of Antiques and Jewelry Designs" by Clarence P. Hornung (1989). It is simply packed with vintage graphics, including quite a few old tea sets, teapots, tea strainers, tea balls and more, all, according to the blurb on the jacket, "carefully arranged for easy reference and use." I had to experiment with the sizes a bit after scanning the images I selected into the computer, but eventually I got them the size I wanted. 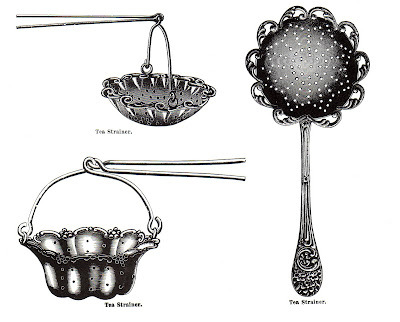 After selecting images of sugar tongs, a teapot and a tea strainer, I printed the three on a sheet of transfer paper. I was just about to put the paper in the printer when I realized I'd forgotten to reverse the images! Yikes! 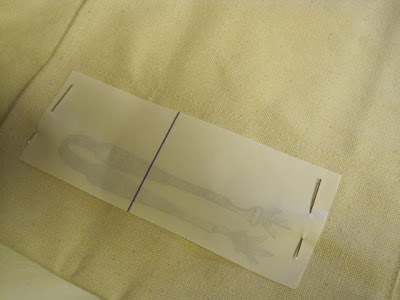 Here you can see the sugar tongs image as I'm about to iron it on the fabric. I knew the images on thick cotton canvas wouldn't be as crisp as on a thinner fabric, but I was going for "effect" with this tote bag, and I think it came out pretty well. 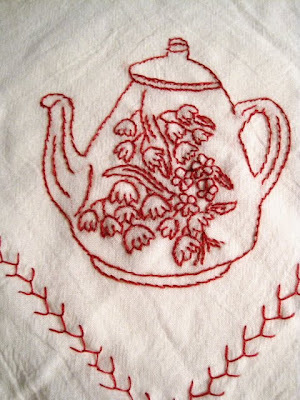 Here's a close-up of the ironed-on teapot transfer. And the fun thing is, I now have lots of "experimental" paper printouts I can use for other crafts, such as cardmaking or decoupage. I must confess that this week's tea was actually tasted quite a few weeks ago, back at week #33. I somehow managed to confuse Huo Shan Huang Ya with Keemun Hao Ya A. Ya, I sure did! So I went ahead and reviewed it back then so at least I would enjoy being one week ahead. Dry leaf appearance: Pencil shavings. Very dark black with a few coppery brown bits thrown in. Wet leaf appearance: Little twiggy bits of tea leaf. Scent: The dry tea scent reminded me just a bit of that smoky Lapsang Souchong (which, have I mentioned, I am dreading tasting). 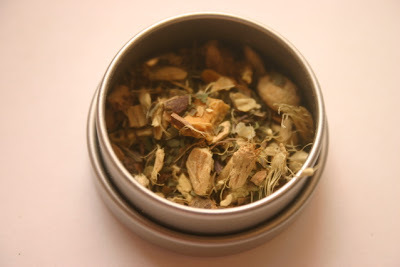 The steeped tea also had a smoky/woodsy sort of scent. Flavor: I happen to like Keemuns and this one had a nice, full taste, no astringency, very nice mouth feel. Additional notes: Michael Harney says that Ha Ya teas are separated into Ha Ya A, the next-best into Ha Ya B. "The grading system is an affectation adopted for the U.S. market; A and B grades don't exist in China." I'm glad I sampled an "A" and not a "B." Grade school habits die hard! 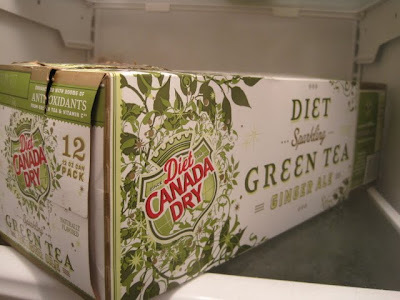 In April 2008, I came across a new drink that tasted great, the new Canada Dry Sparkling Green Tea Ginger Ale, but I didn't like all the sugar so I never bought it again. 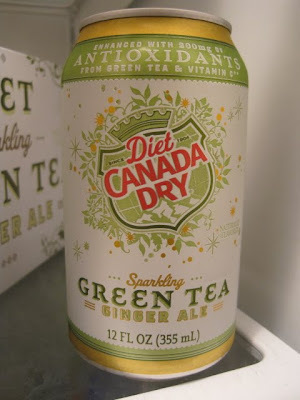 So for those of us who favor diet colas, I have great news: Diet Canada Dry Sparkling Green Tea Ginger Ale has arrived! 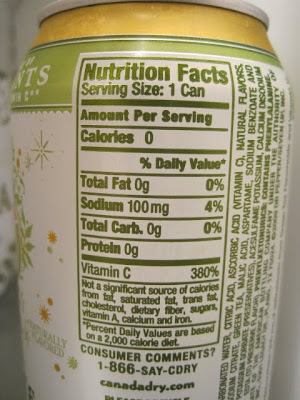 If you're a diet drink drinker, here's the pertinent information. I really, really like this diet version. Nice work, Canada Dry! Lots of blogs I've been reading lately have featured pretty embroidery projects, so it was really just a matter of time before I did one myself. 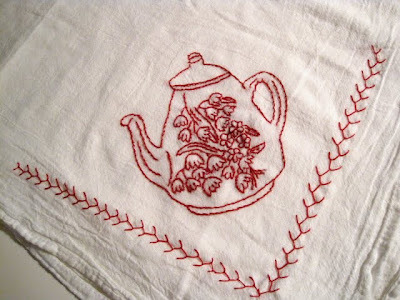 Recently I came across some lovely teapot iron-on transfers from Lace Tales, and I stitched this one on a flour sack towel I had been meaning to embellish. The sample I saw in the store had a simple feather stitch design on the corner, so that's what I stitched around mine as well. Not a bad result for only two evenings of stitching, I thought! 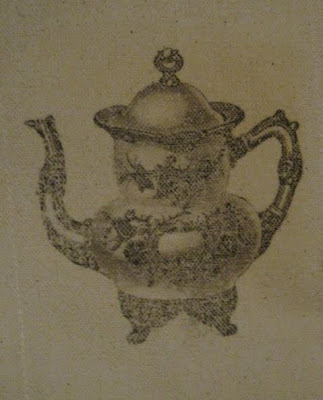 There are eight more teapots included in the package of transfers I purchased. If you want to see more, go to Lacetales.com. ... MARILYN MILLER! 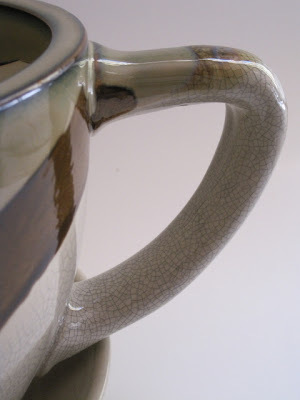 Congrats, Marilyn, and I hope you enjoy the new tea mug! Do you have a Whole Foods store near you? The company is really missing out by not locating one here in Newnan, because I know so many people who would shop there. Since I was near one over the weekend, I took the opportunity to run in and check out the tea selection. I truly don't need any more loose tea or bagged tea for months, so I made some selections from the bottled and canned tea section of the store. And what a selection they had! It didn't hit me until I got home that I actually chose all green tea drinks. Isn't that interesting, since before this year I didn't think I really cared for green tea? 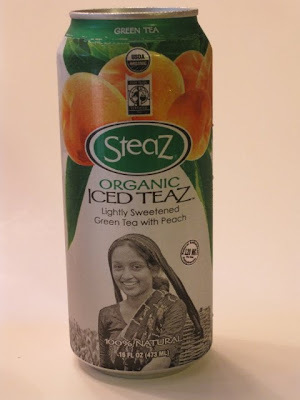 Now canned tea is probably my least favorite way to have tea - a bottle is simply more aesthetically appealing - but I have to say this peach flavored green tea variety of Steaz Organic Iced Tea was absolutely delicious! I've gotten pretty picky about my "peach" flavors in food and drink, but I halfway expected to find a peach pit in the bottom of the can. Unbelievably good and authentic tasting! 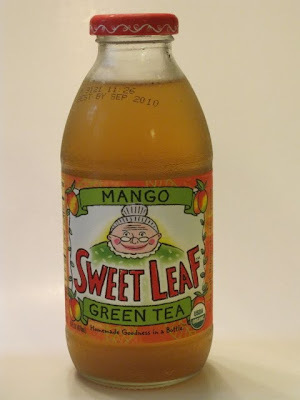 This Mango Green Tea from Sweet Leaf appealed to me because of the fun (and funny!) graphics. It was delicious and had a great but subtle mango flavor. 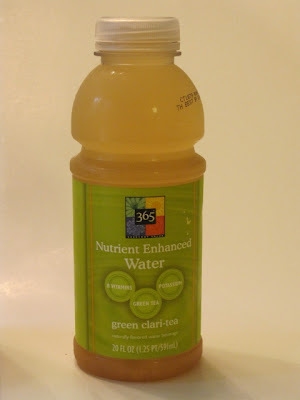 And I must confess I don't much care for the flavored "waters" I've tried, but I had to try the 365 (Whole Foods brand) Nutrient Enhanced Water simply because the flavor is "green clari-tea." Love that! I didn't expect this one to taste too good, so I was pleasantly surprised at the nice citrus flavor of this drink. 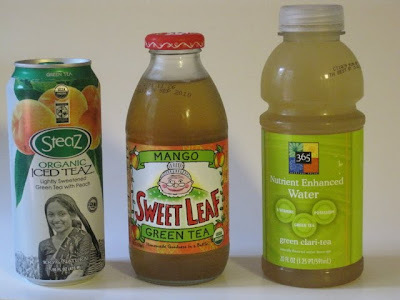 All of these teas are naturally sweetened with organic cane sugar/juice, so if you're someone who doesn't drink the artificially sweetened stuff (and I do), these would be great drinks to try. Now, if Whole Foods would simply come to my town! 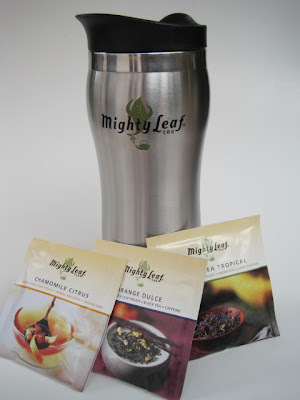 Win a Mighty Leaf Tea Top Brew Mug! Want a new tea mug? 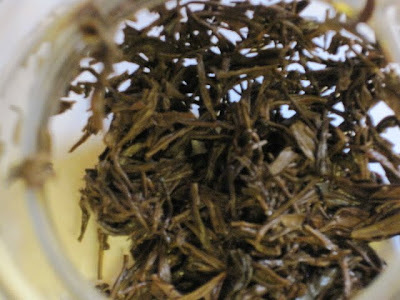 I reviewed the new Mighty Leaf Tea Top Brew Mug on Friday, and they have offered one as a giveaway to a reader of this blog. If you'd like to win your own tea mug like the one in the Sept. 11 post, just leave a comment before 7 a.m. tomorrow saying "Enter me" or something like that. If you're the winner, I'll get your mailing info and send it straight to Mighty Leaf so you'll soon be sipping in style. Good luck! I sure hope some of you reading today know what ATC's are! 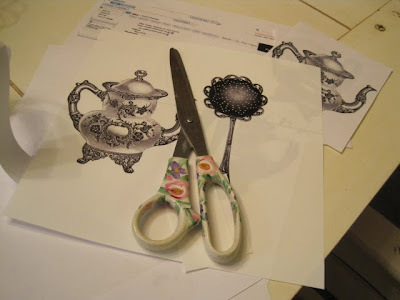 A few years ago, the ATC or "Artist Trading Card" became the "it girl" of papercrafts. 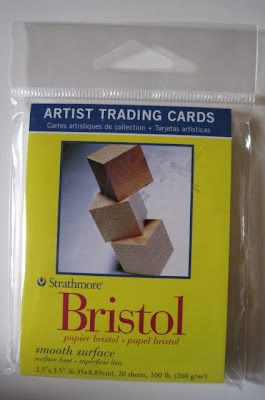 It seemed I could hardly pick up a crafting magazine without reading about these nifty little 2-1/2 x 3-1/2 inch pieces of art being traded like baseball cards of yesteryear by scrapbookers, quilters, cardmakers, and just about anyone with a creative bone in their body. I have never been asked to participate in an ATC swap, but I've long wanted to. As a tea lover, however, I have decided to turn my ATC's into A-Tea-C's. In other words, I'm going to make tea-themed Artist Trading Cards and call them Artist Tea Cards. The first one I made, above, uses scrapbooking papers, a stamp that came on an envelope in the mail, and a button. 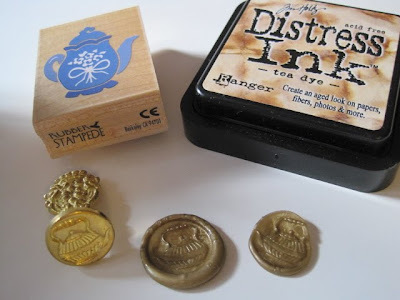 And here's the second one I made, using paper scraps, rubber stamped letters spelling "TEA," and a wax seal impressed with a teapot design, all aged with tea dye distress ink. As you can see, these are pretty simple. You just start with any blank slate piece of paper that is exactly 2-1/2 x 3-1/2 inches. That is the *only* requirement for ATC's, that it be that size. I bought a pack of 20 pre-cut cards at Hobby Lobby for $2.49, and while I could chop my own from scrapbooking papers and cardstock, I like having this little packet of cards always on hand. If you remember that giant mug I got last week, the one I said was intended for a "crafty" purpose, well, here it is! 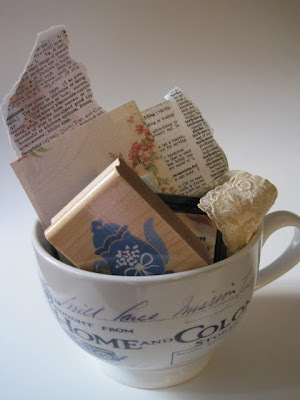 I'm using the mug to hold the little bits of lace, paper, old dictionary page clippings, buttons, rubber stamps and other small goodies that have been culled from my supplies to be used just for the Artist Tea Cards. 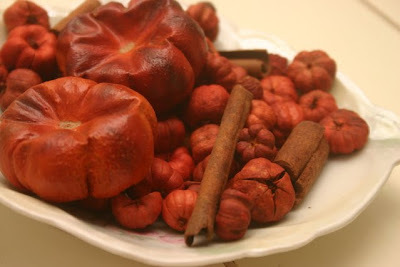 I am so happy to have arrived at the Keemuns just as cooler weather has begun to arrive. The high was only 79 degrees yesterday. Brrr! Dry leaf appearance: Dark, almost black bits of tea leaf which, thanks to a comment I recently read about another tea, reminded me of pencil shavings. Wet leaf appearance: A bird's nest after a tornado. 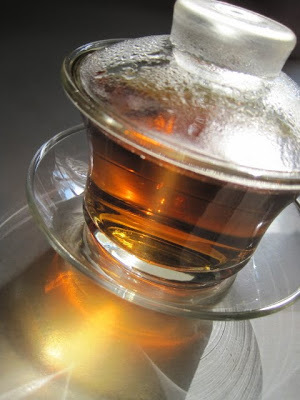 Scent: The dry tea had that lovely earthy scent I know to be Keemun scent. The steeped tea? Now don't freak out, but ... it reminded me of wet leather and fire ashes -- and I loved it! 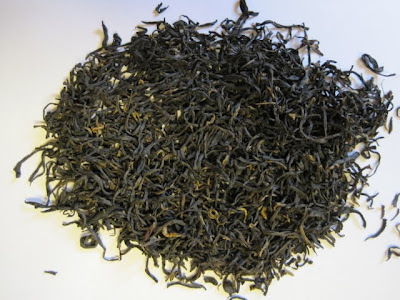 Flavor: This tea has a great earthy taste I love, and I drank it straight black. Additional notes: From the Harney book: "The name Keemun is an older Western spelling of the town now known as Qimen (pronounced "Chee-men"). 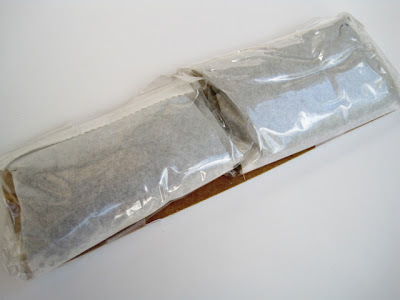 There is also great information on how and when this tea is harvested. Get ready to sew, Sandra! 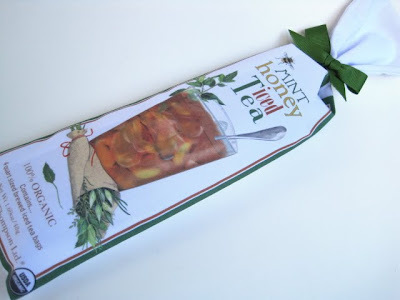 A Debbie Mumm tea fabric giveaway! Opening Day at Holly Cottage Tearoom!